I have been getting tons of emails from all airlines about mileage promotions. Most recently I received an email from American telling me a 33% discount if I bought 1,000+ miles. Here’s the link in case some are interested. If you look at the offer, it’s really not worth it. The asking price for 1,000 is $27.50 — that is $0.275 per mile when the airline industry standard is $0.01 per mile. 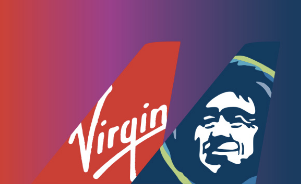 Furthermore, airlines are applying more fees when you use your miles to redeem for flights. 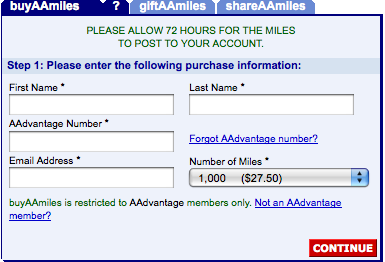 If you are serious about purchasing miles, ghetto Delta has a better deal. Here’s the link if you’re interested. 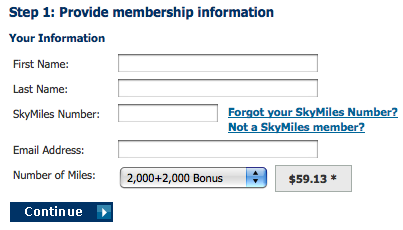 To create confusion and masking the actual cost, Delta is asking for $59.13 for 2,000 + 2,000 free bonus miles. If you do the math, it’s $0.147 per mile – as 50% savings compared to AA. United is the most expensive out of the big three airlines. UAL wants $67.25 for 1,000 miles. In addition, UAL also wants to charge you a $35 service fee. I could understand that Delta & American may be higher because points.com is processing the mileage purchase for you but UAL seem to be doing the mileage fulfillment themselves. Are these airlines serious? Do they think people would actually pay for airline miles when they are depreciating them? I will have a follow up post on what you should do with your miles in a few days.